"Power concedes nothing without a demand. It never did and it never will. 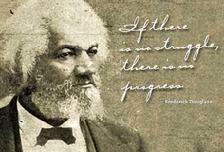 Those who profess to favor freedom, and yet depreciate agitation, are men who want crops without plowing up the ground." "Perhaps no one was more surprised that DADT ended in 2010 than the president himself. [E]nding the ban was not the White House plan at all for 2010. Obama’s plan, such as it was, was to push repeal off until 2011, when it was unlikely to have passed Congress. One maverick LGBT group in particular, GetEQUAL, was able to gain traction in Washington with headline-grabbing direct actions, such as chaining uniformed personnel (including Dan Choi) to the White House fence, and disrupting Democratic fundraisers." - Historian Nathaniel Frank, New Republic, February 19, 2013. "I think the important thing we can look at are the people who got their issues addressed. The people who were absolutely unrelenting, who didn't try to play an inside game. It was the outside game that won this time. The GetEQUAL people were remarkable. Dan Choi, the people who chained themselves to the White House—they really put themselves out there and pushed. [If the President’s not using the bully pulpit] as he wasn't on the Dream Act or Don't Ask, Don't Tell, then we know it's not a priority for them. We want the whole thing and we're not going to take anything less. And, I think that's why we're all sitting here celebrating today, because they were uncompromising in what they wanted." - Jane Hamsher, Firedoglake, The Lawrence O'Donnell Show, MSNBC, December 22, 2010. From TSgt. Leonard Matlovich to Lt. Dan Choi: "In every generation a hero will arise." both for myself and in memory of Leonard to join gay veterans Dan Choi, Miriam Ben-Shalom, Father Geoff Farrow, Evelyn Thomas, Justin Elzie, Ian Finkenbinder, Mara Boyd, and Rob Smith, as well as transgender veteran Autumn Sandeen, and Robin McGehee, Dan Fotou, and Scott Wooledge, in getting arrested at the White House for nonviolent civil disobedience while protesting the President's doing too little to help end the ban, and the move by some in Congress to abandon the repeal effort. This followed a morning memorial to Leonard at his gravesite, and a visit to Senate Minority Leader Harry Reid's office to ask when he is going to keep the promise he made when accepting Dan's West Point ring to see DADT repealed, also organized by GetEQUAL. These two videos, courtesy of Joe Sudbay of AMERICAblog Gay. include the moment the police began to force reporters to the side and spectators all the way across the street from us. We were allowed to remain there for roughly half-an-hour before the arrests began by cutting the handcuffs with which we'd attached ourselves to the fence. Ultimately we were vindictively prosecuted under a federal statute almost never used in such cases, and threatened with up to two years in prison. 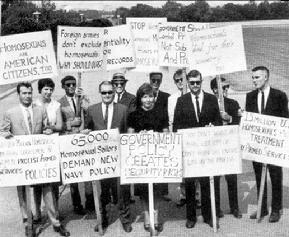 See DADT—Before & After page for ban protests dating back to 1964. Don't Ask, Don't Tell US to Wait UPDATED 11/2/10 from David Wallace on Vimeo. 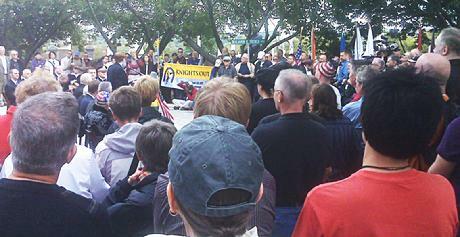 Superb video montage by David Wallace of the May 2nd, 2010, protest against President Obama's inaction on DADT. Some full speeches below. Howard Dean mentions Eric Alva. For the record, Eric was in the Marines not the Army when he lost his leg in Iraq. The person holding the megaphone is Justin Elzie who outed himself in 1993 to help the lift the ban effort then. He continued serving as an out gay Marine for four years while his case worked its way through the courts, finally reaching a financial settlement and retiring.